PudnerSports.com: Final 2017 Value Add Calculations based on Positions, Replacement Players. Final 2017 Value Add Calculations based on Positions, Replacement Players. A few key end of season calculations going into March Madness. We run the numbers "by position" near the end of the year to adjust each player by their position. The first note is that in the modern world of freedom of moving college basketball, our classification of position is not always what you will see listed elsewhere. Rather, players are classified based on who on the team appears to play closest to the basket on offense and defense (defined as the center) verses those who play the furthest away from the basket as indicated by a lot more assists than defensive rebounds. Based on these categories, the center's had the easiest time this year, boosting their stats with more chances for rebounds, but the other five positions had almost as good a chance to get key stats leading to the following adjustments to each players initial AdjM rating. To get the actual value of the player to the particular team on which he plays, you must adjust for how strong the team's bench is. 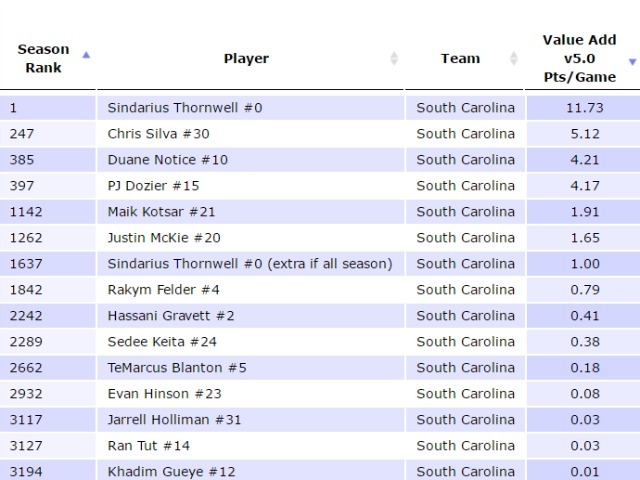 To do this you subtract the Value Add of the 6th best Value Add, in this case Justin McKie's 1.65, to determine Thornwell was actually worth 10.08 points per game to South Carolina (11.73 minus 1.65). This is similar to baseball's WAR (wins above replacement) but is actually the result of the "domino" effect of each of the next several players needing to take on more responsibility, as explained in great detail in this piece for Big Apple Buckets. 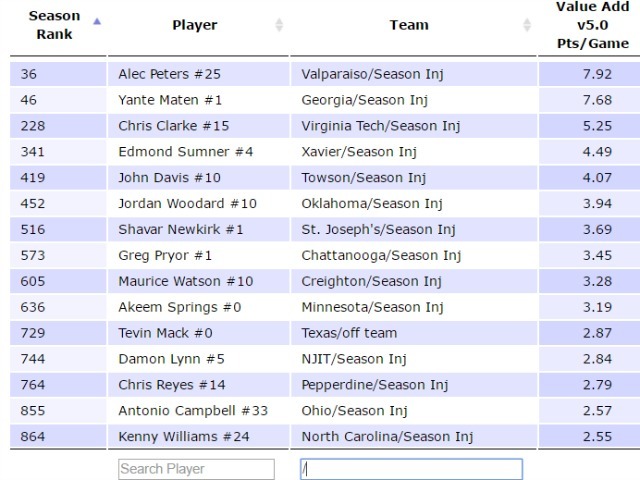 To find injured players that no longer factor into the team's value, you can simply type the front slash into the "Team" search field, which prior to 2017 March Madness showed these as most damaging injuries. In fact, most were stunned when Milwaukee beat 1-seed Valparaiso in the Horizon League, but the fact is Valpo had the biggest loss in the season in Alec Peters and so was eight points worse than their Sagarin rating would have indicated based on their play with Peters on the court.